Deeply nestled in the rift valley, the hundreds of tombs and extensive remains of the Nabataean metropolis that was once that nation’s capital city of Petra, evokes a sense of geographic protection and isolation from the outside world. With its sprawling development, Petra became a bustling city with exciting and distinctive architectural and artistic styles as the Petraeans determined what a resplendent capital with a burgeoning population and assured economic future should represent. 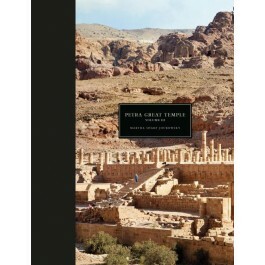 This third volume devoted to one of its most impressive edifices, the Great Temple, builds on the previous two volumes of excavation reports to examine many facets of Nabataean material culture. It exposes a cross-section of the material culture, from water-supply systems and architectural designs to studies of artifacts (sculpture, ceramics, numismatics, metal and bone) and subsistence patterns. Part I explores the principles of the temple layout and how it was built including Nabataean construction techniques, hydraulic systems, decoration, art and and subsidiary buildings of the precinct. Part II is devoted to additional aspects of Nabataean material culture, with chapters devoted to the site databases, ceramics and Nabataean potting traditions, lamps, figurines, glass, coins, faunal and worked bone analyses, metal objects, ballista balls, and sculpture. The volume is supported by an online database http://www.opencontext.org designed to assemble special research materials that could not be published here in print which provides the tools for researchers to perform their own analysis of the data. "…will become an indispensable compendium for many questions."